Nate Wade Subaru is proud to be part of the Salt Lake City community, which is why we've signed the Subaru Love Promise. The Subaru Love Promise is a pledge by Subaru to work to make the world a better place through community involvement--and we're glad to be part of it. We're partnering with the National Ability Center, a group that empowers individuals of all abilities. The National Ability Center offers many sport, recreation, and education programs designed to accommodate people who are differently-abled; in addition, they use specially-designed equipment so that everyone can join in, regardless of their ability. NAC is also dedicated to developing lifetime skills and self-esteem in everyone--in fact, they've helped athletes participate in the Paralympic games! 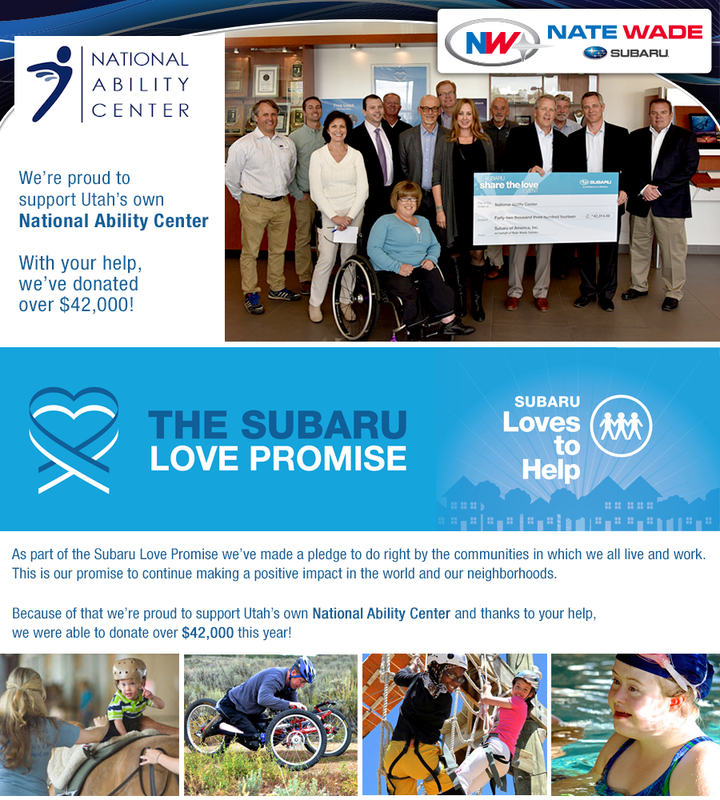 Nate Wade Subaru is proud to partner with this amazing organization that does so much good for people here in the Salt Lake City area. Here at Nate Wade Subaru, serving Draper and West Valley City, we're proud to be more than just a place to find great deals--we're a great place to do business. We have a huge lot filled with a wide variety of new Subaru vehicles, pre-owned vehicles, and Subaru Certified Pre-Owned vehicles--as well as a service center that's staffed with expert technicians and a parts store that's filled with genuine Subaru parts, chemicals, and accessories. But as proud as we are of all that we offer, we're even more proud of being a part of the Salt Lake City Area community--which is why we've signed the Subaru Love Promise. Come by Nate Wade Subaru, serving Sandy and Bountiful, and see how we can help you. If you have any questions, call us at (888) 586-8323, or stop by 1207 South Main, Salt Lake City, UT 84111. We hope to see you soon!